With some of the biggest waves of the season hitting the North Shore, Justin Remais was ready to ride until he was cautioned by lifeguards. His board looked too old -- 15 years --and lifeguards wanted to make sure the 37-year-old was not a novice surfer. » Week ahead: A moderate northwest swell is expected to arrive Monday, and a small south swell will arrive early Tuesday. 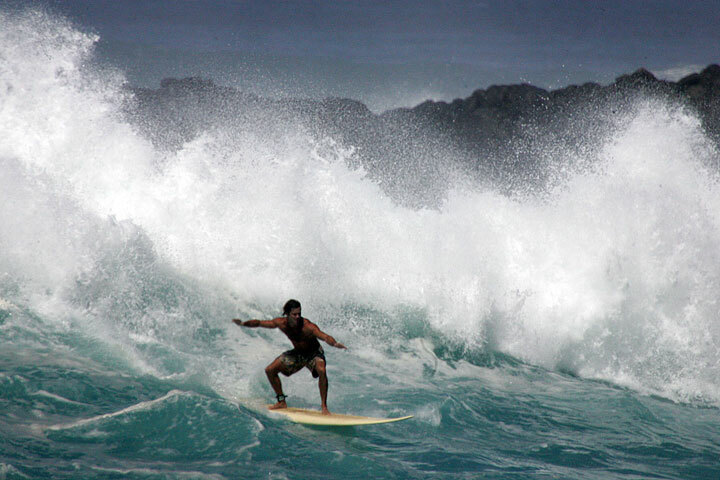 "These guys are really on the ball out here," said Remais, a 20-year surfer. "They wanted to make sure I was no Joe Blow." The reason for the extra caution was a high-surf warning with waves of up to 25 feet for most north-northwest shores of the Hawaiian Islands. By 4 p.m., lifeguards on the North Shore had made five rescues at Ehukai Beach Park and five assists by Jet Ski. 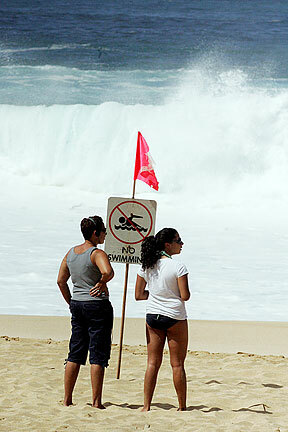 Lifeguards on Oahu reported 402 preventive actions. On the West Shore, lifeguards rescued four people, assisted 25 surfers with Jet Skis and reported 175 preventative actions. "We're at the edge of our seats here," said Lt. Pat Kelly of Ocean Safety, who noted the waves were the biggest of the season. "Days like these make it very challenging to be a lifeguard." Up to 30 surfers were in the water at any given moment at Waimea Bay, Sunset Beach and Ehukai Beach Park. 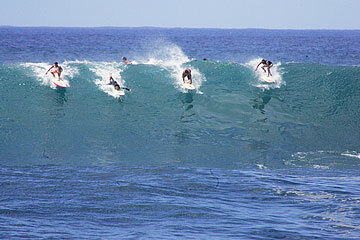 There was also a tow-in surfing contest in Haleiwa. Surf at warning levels was to decline today, according to the National Weather Service. But waves were still forecast to reach 15 to 20 feet on north shores and 8 to 15 feet on west shores. Yesterday started with the rescue of a 20-year-old surfer near Ehukai Beach Park. At about 8:45 a.m. a lifeguard swam through waves up to 15 feet high to rescue the man. Only one personal watercraft was available for use yesterday, and the two people certified to use them had not arrived, so the lifeguard called in a helicopter from the Honolulu Fire Department. Firefighters assisted in three more water rescues on the North Shore yesterday afternoon and evening, a spokesman said. The Fire Department helicopter was called out for a swimmer in distress at about 7 p.m. at Off the Walls on the North Shore, but a bodyboarder helped the swimmer back to shore before the helicopter arrived. "Our backup for the Jet Ski is the helicopter," Kelly said. "We like working with other agencies, and they're always willing to help out." The North Shore's 19 lifeguards also had their hands full with hundreds who showed up to watch the waves. Lifeguards scurried up and down the beach in all-terrain vehicles, warning beachgoers to stay back, as rip currents could easily pull people into the water. "Days like this are special days, for the professionals and veterans," Kelly said. "The best days are when the most people can go surfing, with 5-foot swells. These waves ... you can't just jump in there." Willie White was at Ehukai Beach Park to watch. The 27-year-old has surfed North Shore waves for 12 years, and said he has seen one too many accidents and deaths. "It looks beautiful, but it's a fine line between life and death out there," he said. White also said Oahu's increasing population could create more traffic in the surf, "just like how you see it on the roads." Ocean Safety has noticed the growing crowds, and might have to increase its lifeguard force sooner or later, Kelly said. "Some days, it would be nice to have more backup," he said. "Other days, what we have is sufficient, but our guys do a hell of a good job."